Bacillus megaterium cells stained with Sudan Black B and Safranin. 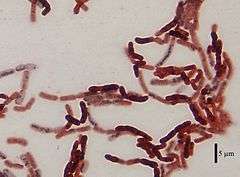 Bacillus megaterium is a rod-like, Gram-positive, mainly aerobic spore forming bacterium found in widely diverse habitats. With a cell length of up to 4 µm and a diameter of 1.5 µm, B. megaterium is amongst the biggest known bacteria. The cells often occur in pairs and chains, where the cells are joined together by polysaccharides on the cell walls. In the 1960s, prior to the development of Bacillus subtilis, B. megaterium was the main model organism among Gram-positive bacteria for intensive studies on biochemistry, sporulation and bacteriophages. Recently, its popularity has started increasing in the field of biotechnology for its recombinant protein production capacity. B. megaterium grows at temperatures from 3 °C to 45 °C, with the optimum around 30 °C. Some isolates from an Antarctic geothermal lake were found to grow at temperatures up to 63 °C. B. megaterium has been recognized as an endophyte and is a potential agent for the biocontrol of plant diseases. Nitrogen fixation has been demonstrated in some strains of B. megaterium. B. megaterium has been an important industrial organism for decades. It produces penicillin amidase used to make synthetic penicillin, various amylases used in the baking industry and glucose dehydrogenase used in glucose blood tests. Further, it is used for the production of pyruvate, vitamin B12, drugs with fungicidal and antiviral properties, etc. It produces enzymes for modifying corticosteroids, as well as several amino acid dehydrogenases. B. megaterium is known to produce poly-γ-glutamic acid. The accumulation of the polymer is greatly increased in a saline (2–10% NaCl) environment, in which the polymer comprises largely of L-glutamate (L-isomer content up to 95%). At least one strain of B. megaterium can be considered a halophile, as growth on up to 15% NaCl has been observed. Phylogenetically, based on 16S rRNA, B. megaterium is strongly linked with B. flexus, the latter distinguished from B. megaterium a century ago, but only recently confirmed as a different species. B. megaterium has some phenotypic and phylogenetic similarities with pathogens B. anthracis and B. cereus, although itself being relatively harmless. B. megaterium is ubiquitous in the environment around us. In addition to being a common soil bacterium and an endophyte, it can be found in various foods (including honey, in which most microorganisms do not grow) and on a variety of surfaces, including clinical specimens, leather, paper, stone etc. It has also been isolated from cow feces, Emperor Moth caterpillars and Greater Wax Moth frass. The method of  described in  can be used to isolate strains of B. megaterium from the soil. The procedure starts with plating 0.1 ml of dilutions of heat-treated soil suspensions on glucose mineral base agar: 10g Glc; 1g (NH4)2SO4 or KNO3; 0.8g K2HPO4; 0.2g KH2PO4; 0.5g MgSO4·7H2O; 0.05g CaSO4·7H2O; 0.01g FeSO4·7H2O; 12g agar; distilled water to 1 litre; adjust pH 7.0. Plates are incubated at 30 °C. White, round, smooth and shiny colonies 1–3 mm in diameter may develop on the nitrate (KNO3) medium in 36–48 hours. However, not all strains can use nitrate, therefore the recommendation to use the ammonium ((NH4)2SO4) medium in parallel. Colonies are detected by their appearance and suspects should be observed microscopically for the typically large cells of this species. The species was described by de Bary in 1884, who called it Bacillus megaterium, but did not give an etymology. However, some subsequent authors called it B. megatherium assuming the name was incorrectly spelled. This trend continues as many scientists (mainly from the developing world) still use the name B. megatherium, sowing confusion. unintentional orthographic error (unlikely given the fact that de Bary and his students, consistently used the epithet "megaterium"), whereas it should have been megatherium", from therion (θηρίον, meaning "beast" ), to mean "great beast". stems from teras, teratos (τέρας, τέρατος, a neuter noun meaning omen or wonder or, indirectly, monster,) which could be interpreted to mean "great monster" (with the Neolatin name being formed incorrectly given that there is no evidence of a Greek third declension noun when converted into Latin becoming a second Latin declention using the nominative stem, which is "ter-" while the other case use the stem "terat-". If were converted into a third decleasion noun it would have been "megateras, -atis"). Consequently it was decided in the first jouridical opinion of the Bacteriological code that the name should remain "megaterium" given the unclear meaning. The etymology listed in LPSN is, despite being not quite correction, a fusion of the first and third interpretation Gr. adj. megas, large; Gr. n. teras -atis, monster, beast; N.L. n. megaterium, big beast. ↑ DE BARY (A. ): Vergleichende Morphologie und Biologie der Pilze, Mycetozoen und Bacterien. Wilhelm Engelmann, Leipzig, 1884. 1 2 3 Buchanan, R. E.; Breed, R. S.; St. John-Brooks, R. (1951). "Opinion 1. The Correct Spelling of the Specific Epithet in the Species Name Bacillus Megaterium De Bary 1884: Approved by the Judicial Commission of the International Committee on Bacteriological Nomenclature". International Bulletin of Bacteriological Nomenclature and Taxonomy. 1: 35–36. doi:10.1099/0096266X-1-1-35. ↑ Lapage, S.; Sneath, P.; Lessel, E.; Skerman, V.; Seeliger, H.; Clark, W. (1992). International Code of Nomenclature of Bacteria: Bacteriological Code, 1990 Revision. Washington, D.C.: ASM Press. PMID 21089234.